The government will be hard pressed to decide who to squeeze next, if you go after the poor (which we take to be people earning less than c. 25k – irrespective of knowing whether this suits them or if they have debt or not) it is politically explosive, they will have a hard time going after the elderly – who have a tendency to not take it lying down (remember the medical cards? ), and those who are rich (we take as earning 100k or more p.a. irrespective of debts) have already been hit hard. which could be due to seasonal factors or it could be a symptom of people not having enough to put by and save. In any economy it is healthy to have money moving around, you get an acceleration effect (and with credit you get a multiplier) on transactions and GDP, one great blockade is if everybody is saving. Keynesian’s may be familiar with the ‘paradox of thrift’ in which you get a situation whereby people saving personally do so for individual reasons, but if everybody does it at the same time (aggregate) then you suddenly have a void left where spending was occurring and it causes stagnation or deflation. 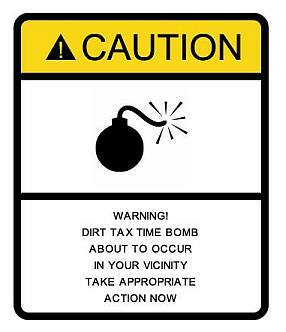 You can’t force people spend, but you can disincentivize them, and for that reason I suspect we will see ‘progressive DIRT tax’ (DIRT stands for ‘deposit interest retention tax) and it is taken at source – which has the added advantage of making it almost impossible to avoid. The best way (politically) to do this is to have DIRT at 25% up to the deposit protected limit of €100,000 and above that have different tiers that people reach depending on total savings held. How many people would feel any sympathy for a widower or single parent with €400,000 on deposit who has to pay 80% DIRT on any interest earned on a sum over €250,000? Not many, which makes it politically easy to do. There are no ‘women and children’ to hold out in front of this policy, virtually nobody ever runs out in defence of the rich, particularly not in Ireland where it is almost seen as a sin to get too far ahead. The politically viable nature of this, the inability to avoid it and the policy advantage of encouraging people not to save too much for too long mean that you can practically bet the family silver on a change in DIRT tax in the coming budget. DIRT is levied at the time the interest is paid, and for that reason if you have a large deposit and feel this increase is likely (as we do) then it would be a good idea to use the PTsb ‘interest up front’ product right now so that you get your interest done and dusted at 25% rather than taking a bigger hit in the months after Decembers budget. This would only make sense for people with very large deposits, if you want advice you can call us on 01 6790990, this is not scaremongering, it is merely looking at a situation for what it is, the state need to raise money fast and there is one group out there for whom there is little or no public sympathy who are prime targets.